Please visit our fabulous sponsor this week, Rick St. Dennis, to see all of his wonderful products! 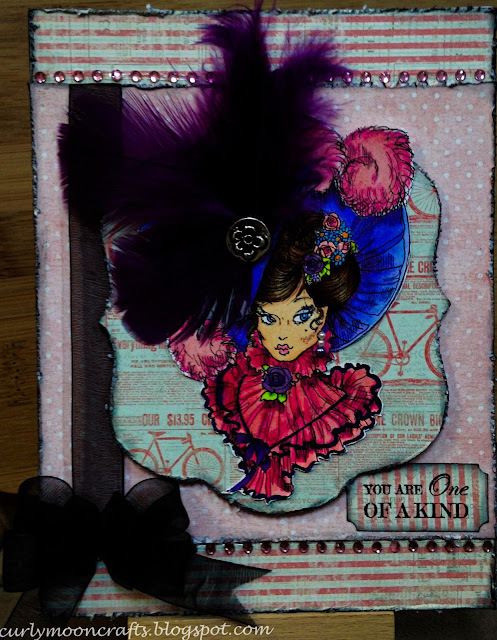 My creation for this week is a card using the digital stamp Ascot Hat. I printed the image onto Spectrum Noir cardstock and colored her with my Spectrum Noir markers. I fussy cut her and added her to a die cut shape cut from the Prima papers. I trimmed the Prima papers to fit the card base, distressed the edges, and edged them with Black Soot ink. Before gluing them to the card base, I added some sheer black ribbon to the center panel. I added a black bow to the bottom and pink gems to the edges of the center panel. On the focal panel, I added feathers and a charm to adorn her hat, small gems for her earring, and a bit of SN glitter pen to the flowers in her hair and dress. To finish, I stamped the sentiment with Memento Tuxedo Black ink and attached as shown. Note: I made the layered bow with my Bow-It-All - it really does help me to make lovely bows - it's hard to see it in the photo, but it is multi-layered and very fluffy! Other: ribbon, feathers, charm, adhesive gems, Nesting die (I think it's from We-R-Memory Keepers/Lifestyle Crafts).